Integrating strong and reliable screw threading into your 3D designs is easy! Once added to your workflow, you'll be quite attached. 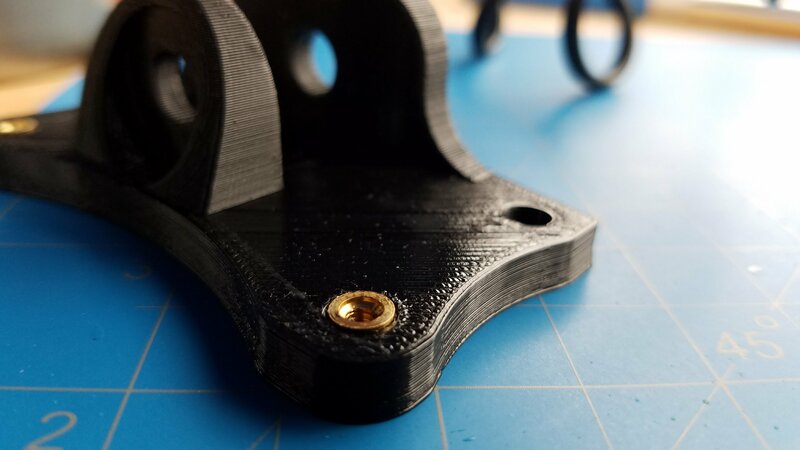 Use brass Heat-Set Inserts to add threaded mounting points to your 3D printed objects. While it is possible to thread bare plastic, repeated use can cause wear leading to threading failure. Heat-Set Inserts are designed to be heated past the plastic glass transition temperature and inserted into the plastic part. The heat is removed once the insert is fully seated. As the insert cools the plastic solidfies, locking the insert into place. While specialized tools can be purchased for installing heat-set inserts, a soldering iron will do the job easily and quickly. If available, choose a soldering iron tip large enough to provide a stable pressure on the center of the heat-set insert, but small enough not to touch any other part of the 3D printed object. Plug in your soldering iron and allow it to come to temperature. Note: If possible set your soldering iron to the filament extrusion temperature used during 3D printing. Place the heat-set insert on the printed part with the smaller diameter facing down into the hole. Wait for just a few seconds. The weight of the soldering iron should allow the heat-set insert to settle into the mounting point. Slowly, gently, and evenly press down until the top of the heat-set insert is level with the surrounding plastic. Remove heat and allow to cool. That's it! A properly set heat-set insert will be flush to the surrounding plastic and aligned with the fastener path. First Time User? : Use tweezers to hold the heat-set insert level. You'll find that after a few installations you can set the tweezers aside and let the soldering iron do all the work. Slower is Better: Go slow for a cleaner top surface. Molten plastic can flow around the top surface of the heat-set insert if pressed in too quickly. Load Up Your Iron: A soldering iron with a fine pointed tip can hold multiple heat-set inserts at one time, increasing the rate at which you can install multiple successive heat-set inserts. Note: the last heat-set insert will be the hottest-- stop pressing the insert in earlier than the others. Use Chamfered Edges: A chamfered edge on the heat-set insert location will leave space for molten plastic near the external surface of the insert, improving the fit and finish. High Strength Applications: Think of the heat-set insert as a wedge. When stressed the heat-set insert should push into the material, not out. Design the model so the fastener passes through the object and into the heat-set insert-- the heat-set insert is installed in the same direction as the future load. Larger Inserts, Stronger Grip: Our internal testing suggests that larger heat-set inserts will resist torque-out-- the larger surface area will help the insert from breaking free and rotating within the plastic object. Solid Walls, Solid Fit: Design the 3D printed heat-set mounting point with a wall thickness set to a multiple of your extrusion width. This ensures that the walls will be 3D printed with solid perimeters with no voids from infill. More Perimeters, More Hold: Find the balance between fine details and strength. Two or more perimiters will give each heat-set insert more plastic to bite into and will also increase the strength of the printed object.